One of the interesting elements in the new wave of monitor technologies is the types of ideas that panel manufacturers are coming up with. In the enterprise space, custom display configurations occur more frequently than we might expect, but for consumers there tends to be a line of standardization. Samsung, being vertically integrated, gives them the opportunity to experiment more than most. Even then, as a reviewer in the industry, one develops certain expectations of what might be coming in the future. Consider me stumped, as TFTCentral has delved into Samsung’s upcoming roadmaps and panel production schedules to pull out one or two surprises. 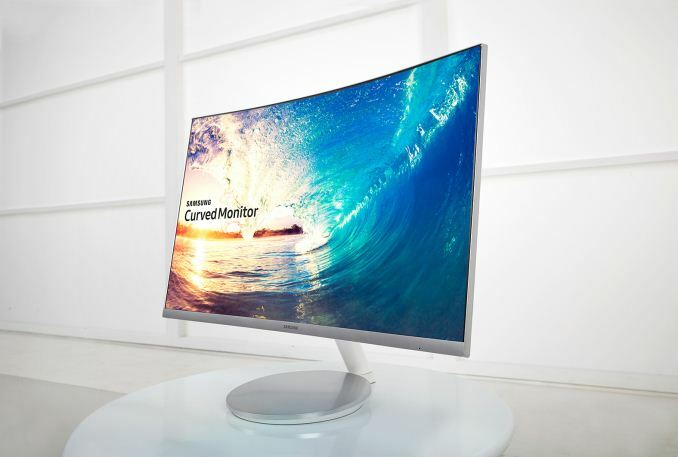 For readers on the leading-edge of monitor configurations, ultra-wide displays in the 21:9 aspect ratio have been on the radar for about two years. These are monitors that have a 2560x1080 display, stretching the horizontal dimension of a standard 1920x1080 Full-HD monitor and make it easier to display modern cinema widescreen format content with less black bars. They are also claimed to assist with peripheral vision when gaming beyond a standard 1920x1080 display, or when curved, help with immersive content. So chalk up some surprise when we hear that Samsung has an even wider format panel in the works. 3840x1080 represents a 32:9 aspect ratio, and the report states that this will be a VA panel with 1800R curvature and a 3-side frameless design. Putting that many pixels in a large display gives a relatively low 81.41 PPI. This panel will be part of Samsung’s ‘Grand Circle’ format, and by supporting up to 144 Hz it is expected that variants of this panel will be included with FreeSync/GSYNC technologies. One figure to note would be the contrast ratio – 5000:1 (static), which TFTCentral states is higher than current Samsung VA panels. This panel is the equivalent two 24.7-inch 1920x1200 screens put side-by-side, and indicates which market Samsung would be aiming for. The specifications seem to be almost identical to the 3840x1080 panel, such as 1800R curvature, but in a 29:9 aspect ratio with 60 Hz and 144 Hz variants. Pixel density is slightly higher than the other panel too, given the higher resolution and lower diagonal, which gives 91.41 PPI. TFTCentral is listing these panels as having an 8-bit color depth (no word on FRC), and likely to be qualified on some amount of sRGB. Other numbers, such as brightness and response time, are still unknown. An amusing aside, for any users looking for a 16:10 display, something like two of these stacked on top of each other might be suitable (albeit massive) if these panels also offer a 3-side borderless configuration. I know Ryan has been after a decent 3840x2400 display, but given our discussions with monitor manufacturers, there seems to be no 16:10 demand from consumers. So while these two panels aren’t official announcements (they don't even have official part numbers yet), and production will depend on how well these technologies scale. But by virtue of being on roadmaps and panel lists it is clear that Samsung has at least been doing research towards some wider aspect ratio displays. Information from TFTCentral is claiming mass production for both of these panels in September 2017, which means we might see some early announcements for retail-grade panels at Computex in June, or at IFA at the end of August with some pre-production run models. Full retail then might happen in the second half of the year, or along with further announcements at CES in January.